Who is deciding about a name space? What's the difference between Machine Tags, RDFa and microformats http://microformats.org/? Is there any good parser for machine tags? I'm using some machine tag in my various projects. Sometimes they are used by some other people/project. In this page you can find a summary of practices and the list of namespace I'm using. Some are widely used like license: or language: but there are some experimental like linkfingerprint:. 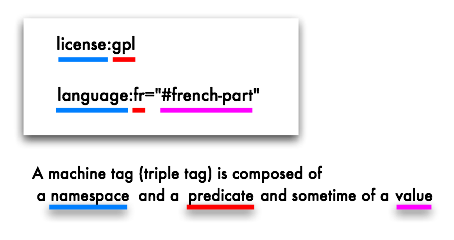 A machine tag is composed of a namespace (MUST), a predicate (MUST) and an (OPTIONAL) value. Machine tag is sometime called triple tag due to its format. Machine tags (MachineTag) are just standard tag with extra information to extend the information in the tag. They are called machine tags because there are often use by program to get extra information from the tagged work. 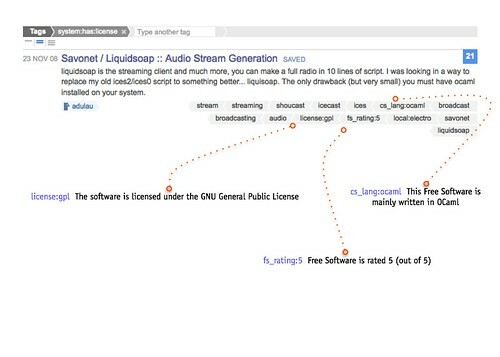 We can see in this example all the information linked to the URL to describe a free software project including its rating, computer language and free license used. Readable by human and machine in one shot. No one, that's the magic (sometime the disillusion) of name space : Everyone can take a name space that can be shared with other people. There are nice example like the "Burning Man" machine tags where you can see there is no specific restriction. But the flexibility of allocation allows people to use their own and see if the other users will use it or not. The success of a name space is based on its use. The objective of RDFa or microformats are somehow similar to Machine Tags but are mainly targeting the (X)HTML format. Machine tags are often used standalone to reflect a specific classification of a page. RDFa or microformats are inherently attached to a link or the data encapsulated in a markup language. Microformats is mostly using the class attribute to describe the data. RDFa is using the rel attribute with a properly defined XML namespace to describe the data. Machine tags can express the same information or even sharing the same namespace of RDFa or microformats. Machine tags are just used as a readable tags format requiring a mixed approach of classification between human tagging and machine-readable tags while not really focusing of specific document format.